Though the metaphor may seem a tad childish at first, this legend reminds us that each and every action we take or opinion we express matters and may help the global voice find an echo and be heard. Using the legend as their starting point Rod Anton & The Ligerians have written songs imbued with an undeniable ecological commitment. Their Reggae is pure stripped-down Roots, with beguilingly skillful arrangements and a touch of early 80s Rockers Reggae sound. “Wevolution” is about our common responsibility through actions defiling the beauty of the natural world and debasing our societies in decline as they sink into unmitigated individualism. Actions that destroy our collective consciousness, and encourage the kind of profit and corruption that poisons rivers, the soil and the entire environment. Contamination that stems from an excess of all types of plastics, and the foolish drift of an oil industry addicted to ever-increasing profits, as denounced by Rod in Addicted. This track features a musical interlude by Vaughn Benjamin, singer of the group Midnite, who has already contributed to the album “Reasonin”. To the sound of Nyahbinghy drums, Vaughn joins Rod Anton in his musical struggle to raise public awareness. Rod and this charismatic artist thus strengthen the collaboration established between France and Sainte Croix, one of the American Virgin Islands that is also Midnite’s native home. He reminds us of the yet unknown side effects of plastics that are so ingrained in our everyday lives. In a second musical interlude, he focuses on another type of pollution — that of agricultural land planted with GMOs sprayed with chemicals and toxic substances peddled by devilish multinational companies and that will eventually contaminate neighboring crops… This musical interlude precedes Seeds of Death, a track with a singular rhythm in which Rod condemns the excesses of the agribusiness while setting up agro-ecology up as the savior of Humanity. The hummingbird metaphor has been used by a large number of organizations for the protection of the environment lately. It aims at heightening public awareness of the significance of individual actions in the struggle for change. It has naturally inspired Rod Anton when writing his new songs. The album features militant songs with haunting instrumental themes such as Carpe Diem or We are One, as well as Like the Hummingbird, the opening track that directly refers to the famous legend. 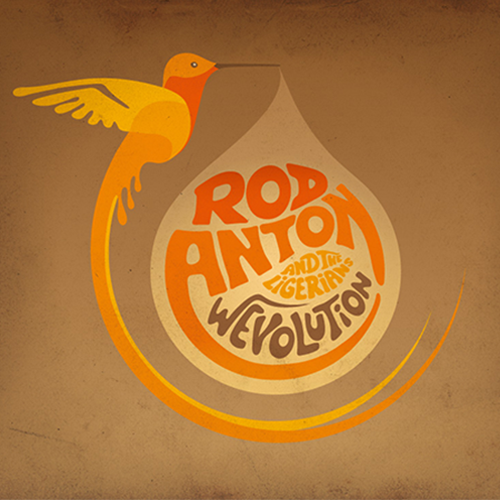 Beyond the political activism of “Wevolution”, Rod also offers less committed songs like Mr. Bear or Lazybone’s Landing; the latter is a hymn to the advocates of procrastination that should not be taken literally as it illustrates the sheer laziness and apathy our society is prone to lapse into. The number Smooth But Revolutionary is a reminder of the very grounding of Reggae music: a passionate revolutionary message with languorous soft bass lines. Gabriel, one of the Ligerians’ guitar players wrote three songs on this album. On the track Balance, he uses the concept of Yin and Yang, a deep-seated stimulus that encourages each one of us to seek a balance in our lives and look for what we believe to be good beyond any moral judgment. On Faceless Men, Gabriel, backed by Rod’s vocal interpretation, pays a tribute to all those people forgotten by History, all those who have struggled over the centuries to prevent our world from sinking into despair and chaos, all those who will never be mentioned in our history books. As for Scandalmongers, it is a critical viewpoint of newspapers and television, pointing a finger at slanderous journalism, spreading distorted information with a view to promoting scandal and better controlling those who are taken in by their stories. This song is also marked by vocal harmonics worthy of the most popular vocal trios of the Golden Age of Reggae. The final track of the album is Come Together. Once again, Rod Anton’s voice is joined by the outstanding falsetto of Cedric Myton, the leading member of the legendary group The Congos. He is Rod Anton’s true artistic “godfather”, and emerges as a master sharing his own experience of life and calling for unity and solidarity beyond individual differences, so as to bring this Wevolution to a successful conclusion! To think my efforts won’t help anybody ? But do you think it can help the situation ? Yes more fashion, we need more! If you disrespect that, it’s your own flesh and blood that you’re gonna hurt! When you’re talking to me, you’re too rough, yeah, Mr Bear! You’re bein’ too tough, me nah like that, Mr Bear! Sure enough you nah need that, Mr Bear! Don’t you think there must be good reasons? Who do you think you are to come and judge me? Sure enough me nah like that, Mr Bear! I say: BPA, what did the Center for Disease Control say? Environmental estrogen release from plastic bottle contact with hot water, migraines. With a genda reverse agenda, multinational research centers said that. Mutated unknown side effects enigma. Ises unto the emperor, Haile I Selassie I the First, Jah! I know that I should stop it, maybe I will…surely I will…Tomorrow! Why are some countries in this world dying of starvation? The richest 20% of the world’s population consumes 80% of the world resources and creates 80% of the world’s waste. We can’t stand it any longer, we are not like our leaders. Wake up my people, out of many we are one! Scream it out, loud and clear, we’re only One single nation, under the same sun! So is it? Is white phosphorous fertilizer and simultaneously chemical warfare? Must I & I flee inescapable agricultural irony, fused and spliced, tec and bio life living in the already? The reap without the seeds, design for emotionless reap, with no repeat. And with humble thanks, all bless and eat. D’ya hear us Mondiablo ? No more Mondiablo !//No a Mondiablo ! That’s what they did in a inner wevolution, Wevolution!!! Why don’t you write the lyrics of your fate ?